Voice and Piano. 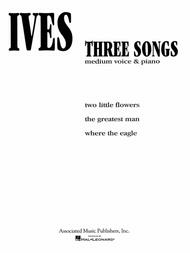 Composed by Charles Ives (1874-1954). Vocal Collection. American, Contemporary, Classical. 8 pages. G. Schirmer #AMP6843. Published by G. Schirmer (HL.50236460). Contents: Two Little flowers • The Greatest Man • Where the Eagle.